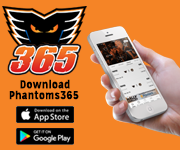 Colin McDonald and Greg Carey both arrived on Sunday to the home locker room at MassMutual Center in Springfield, Massachusetts, a locker room they have been in before. 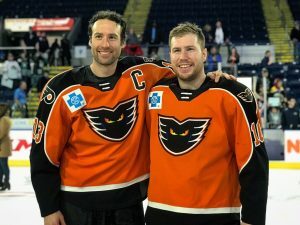 McDonald started his career in Springfield, playing for the Springfield Falcons from 2007-2010 and Carey played for the Falcons for one season in 2015-16. The two Lehigh Valley Phantoms forwards joined the rest of the Eastern Conference All-Stars in the Springfield Thunderbirds home locker room, and introduced themselves to each other as the prepared for the Skills Competition on Sunday night. The first event featuring a Phantom was the Rapid Fire contest. Colin McDonald teamed up with Trevor Carrick of the Charlotte Checkers as they alternated shots on Josef Korenar of the San Jose Barracuda. 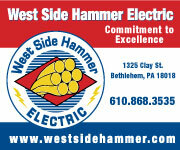 The two combined for four goals for the Eastern Conference squad. Next up was the CCM Hardest Shot contest, where Phantoms’ leading scorer, Greg Carey got a chance to show off his incredible slap shot. Carey was the second player to shoot, and kicked things off for the Eastern Conference. Carey started things off with a 97.9 mph shot on his first attempt. On his second attempt, Carey unloaded a 100.4 mph bomb that stood as the eventual winner, earning him the hardest shot title. Carey was the only one of eight shooters to break one hundred with Andrew Campbell finishing second with a 99.5 mph shot. “You really just want to hit the puck, try not to fall, and hit the net,” said Carey on his strategy for the shot. He said he learned to take a shot so hard from shooting metal pucks into his parents’ garage door growing up. 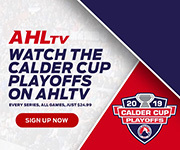 Colin and Greg were back in action as they worked together, along with Binghamton Devils forward John Quenneville in the Pass and Score contest but the trio were unable to score on Milwaukee Admirals goaltender Troy Grosenick. The final event was the Breakaway Relay. 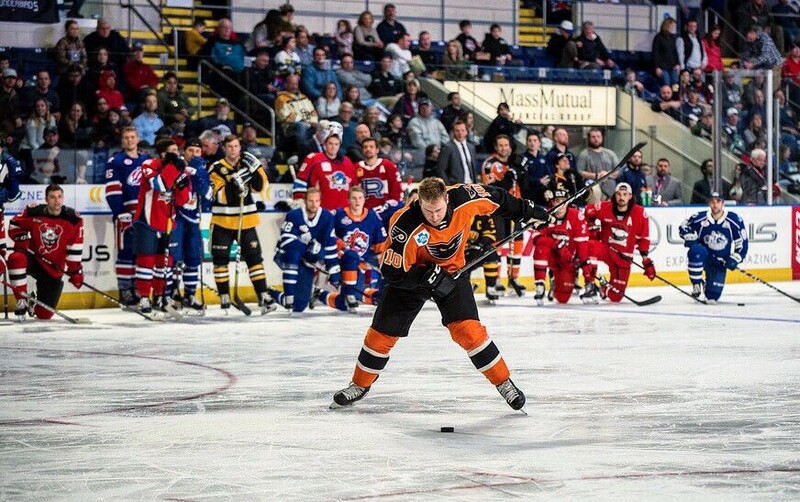 Greg Carey was unable to beat San Diego Gulls’ goalie Kevin Boyle but Colin McDonald was able to beat Grosenick in this event to score for the Eastern Conference but it wasn’t enough as the Western Conference won the Skills Competition with a score of 17-14. 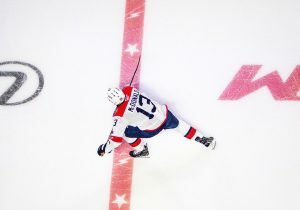 On Monday, McDonald and Carey returned for the 2019 AHL All-Star Classic. 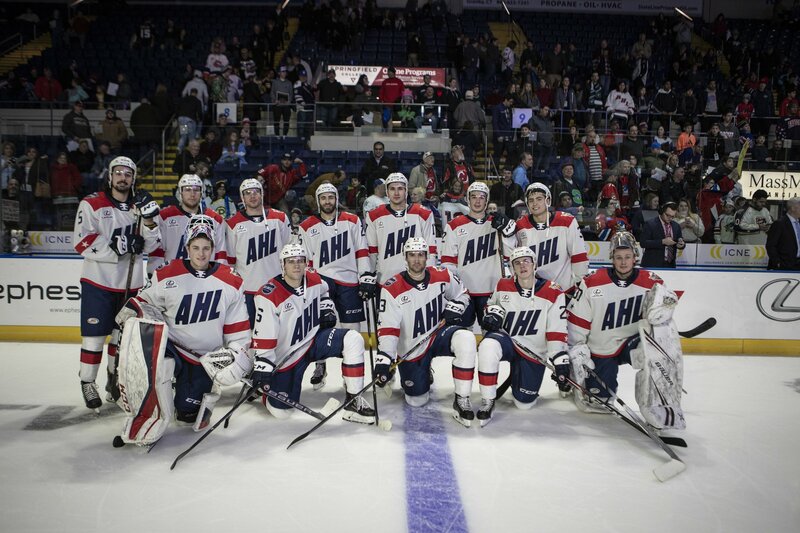 It was McDonald’s third AHL All-Star game, while Carey was making his first appearance in the event. Both guys were confident in their Atlantic Division team to earn the victory. 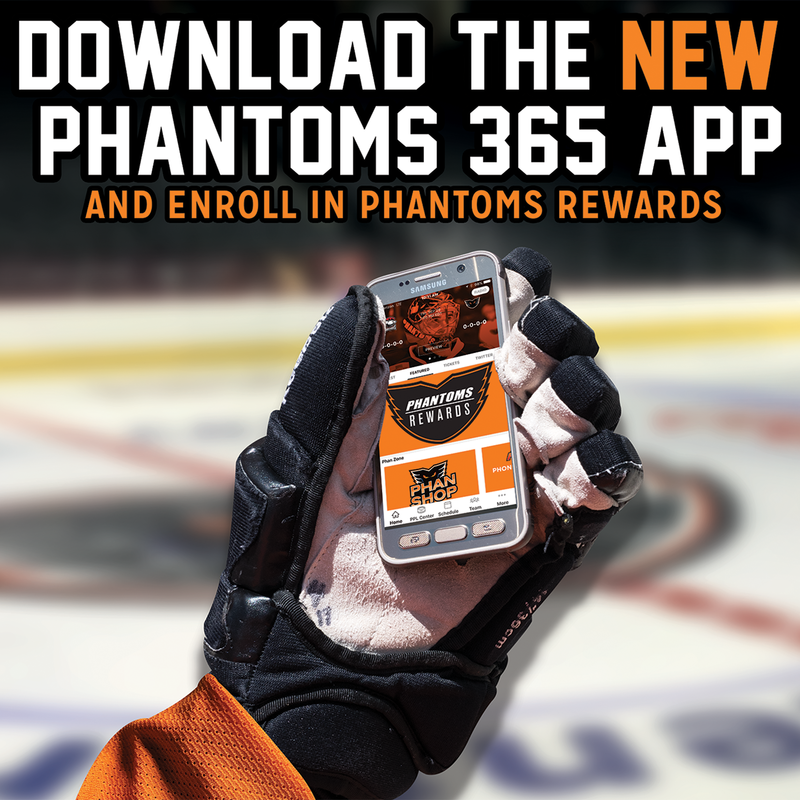 “I think we have home-field advantage and definitely the home crowd, so hopefully they can help us along,” said Carey. “There’s so much skill in this room, it’s kind of humbling for me to be in the same room as these guys,” added McDonald as he looked around at his fellow all-stars. 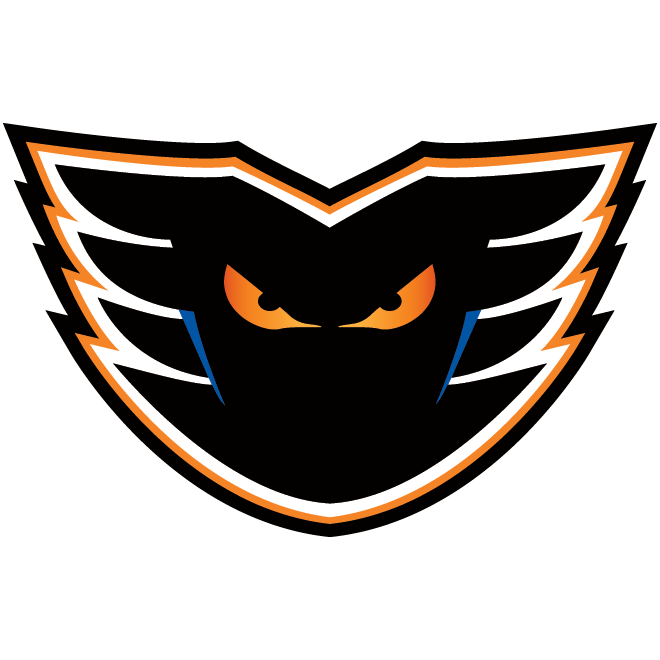 In Game 1, Colin McDonald scored the first goal of the night for the Atlantic Division. McDonald got in all alone on a breakaway and ripped a laser top shelf. McDonald joked before the game he was using tonight as an audition for Kerry Huffman to use him for a 3-on-3 overtime shift and he made a compelling case with his first shot of the day. 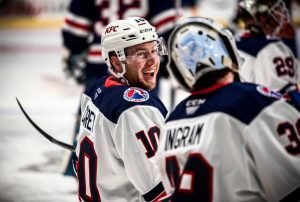 Greg Carey picked up an assist on a Trevor Carrick goal as the Atlantic Division won Game 1 over the Central Division 3-1. The Atlantic Division was back in action in Game 4 as they beat the Pacific Division 5-2. 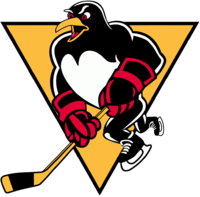 McDonald notched an assist on a goal from Wilkes-Barre/Scranton’s Ethan Prow. 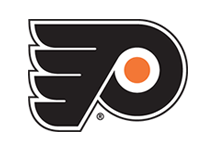 The Atlantic Division suffered their first loss in Game 6 with a 4-1 loss to the North Division. Greg Carey scored the lone goal for the Atlantic Division to make sure they avoided a shutout. Carey skated in and snapped that hardest shot by Connor Ingram for his first goal of the evening. With a 2-1 record, the Atlantic Division qualified for the Championship game against the North Division but eventually fell 1-0 in a shootout. Both Colin and Greg finished with a goal and an assist on the night. “It was an honor. It was a ton of fun and something I’ll remember forever,” said Greg Carey about the weekend and his first All-Star game appearance.